Our ability to build relationships and positively influence people is one of the most important life skills we can possess. These sessions, lasting around one hour, help students become more effective in their interactions with others - in both their personal lives and future careers. Topic choices support the development of students’ emotional intelligence through the use of empathy and self awareness. We also offer a session that shows students how to use storytelling and other techniques to gain a competitive advantage in interviews. 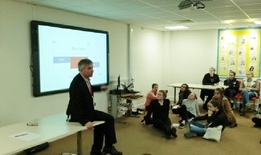 Insight sessions are highly interactive, last around one hour and are suitable for whole year groups. Each one contains a practical exercise to help engage students and embed key learning points. Eleanor, Head Girl, writes: We first talked about how we negotiate in everyday life and were surprised to find out how often we needed to! They also explained to us how businesses negotiate and how many roles in the workplace need to have good negotiating skills, not just buyers and sellers. We also learned about the two different types of negotiation: competitive (where the relationship between people is not important and each is out to get the best deal) and cooperative (where the negotiators want to keep a good relationship and work out a compromise). Finally, to experience how the negotiation process worked, we were split into pairs with one buyer and one seller and given a brief about how we would negotiate with each other over the price the buyer would pay for a pencil; this led to some very heated debates! We are extremely grateful to Paul and Keith for coming to speak to us and all found the talk really interesting and enjoyable. What’s the other person’s story?